Developing and debugging Flex applications on Google Chrome sometimes can be a little tricky, but I will show you here how to solve this common problems. 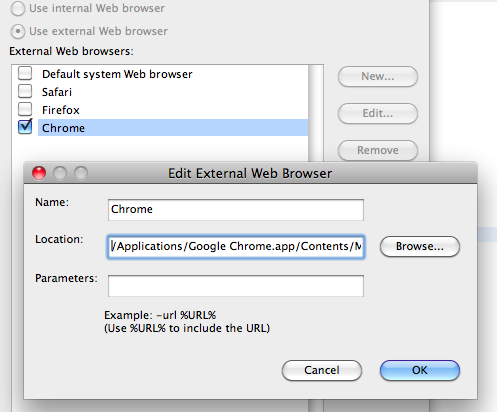 If you are using Windows, you should click "Browse..." and find your Google Chrome application .EXE file. Google Chrome have it's own Flash Player, so even if you download the debugger version, you may have problems to debug. So first, if you don't have the debugger version, download it. Update: If you can't disable plugins, download the Google Chrome development version here. After that, right click any flash content and look for the option "Show Redraw Regions". If you have this option, you're using the debugger version. If you keep refreshing your application all the time, you may have some problems with caching. And, since I don't think Chrome have some quick setting to disable cache, I've created a simple application that will launch Google Chrome with some command line parameters that temporarily disable cache. Notice that, since Google Chrome will keep only one initial instance, you have to launch it using my app at the first time if you want no cache. If Chrome is already running, it will still keep caching files. If you want your cache back, just quit and open Chrome using the regular app icon. This beautiful black Chrome icon was created by GreasyBacon. Don't forget to check his other works. That's it! The only problem that I'm still trying to solve, is when you use the option "Find in Language Reference". It will not open! If I find some solution, I will update this post. Do you know how to solve it? Leave a comment!